If you haven’t seen the movie Back to the Future, you’re really missing out. It’s a well-made adventure/comedy about a teenager accidentally sent back in time by a harrowing turn of events, and the machine created by the Doc, played by Christopher Lloyd (still deep in “Reverend Jim acting mode”). It’s also the movie that single-handedly made every kid who saw it want a DeLorean. So why is it that with a film so creative, you still get this kind of half-assed crap for a game? 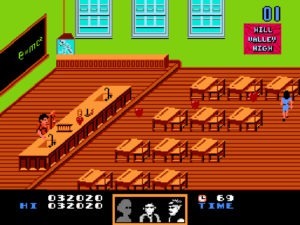 The game follows film protagonist Marty McFly as he tries to leave 1955 and get back home, while also undoing the damage he caused by his arrival, such as making his mom fall in love with him instead of his dad. (yikes) Apparently this involves a lot of running down streets – a WHOLE lot of running – and four minigames breaking up, well, your street running. 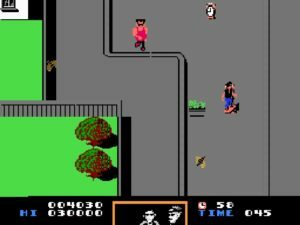 Hey, remember Paperboy? So did these developers. Except instead of having a bike and something to do, you’re just running from point A to point B and dodging hazards. “NES Logic” defines the vile dangers – giant bumblebees, hula-hoop girls that shoot… something, men walking down the street carrying panes of glass – essentially the most random and naturally harmless collection of 1950s objects you can imagine. To assist you in your quest you can pick up an icon allowing you shoot infinite bowling balls at your foes, as well as the nifty skateboard which allows you to zip through levels at twice the speed. Welcome indeed, but hit something once and they’re gone until you find them again. Mmmmm. Fun. The only interesting part about these segments is their form of timing you. Since the younger version of your mother has developed the “the passion” toward you, your brother and sister are disappearing from existence. As in the movie, this is demonstrated by a photo with your siblings slowly fading away. Once they’re gone, it’s your turn. When you’re gone, you die and have to start over. Unlike the movie, this process goes by at lightning speed and you must continually pick up clock icons in mass numbers to keep it at bay. It sounds interesting, but it’s not. Most clocks you can grab while you’re dodging and running, often they’re on the same “safe” paths. Their inclusion adds a little something to the game but not much. You’re still monotonously sprinting down graphically barren streets, with the same hazards and backgrounds scrolling by. Not since the movie Run Lola Run has one person run so much, down streets that look so similar to each other. Except that movie actually made the process interesting. 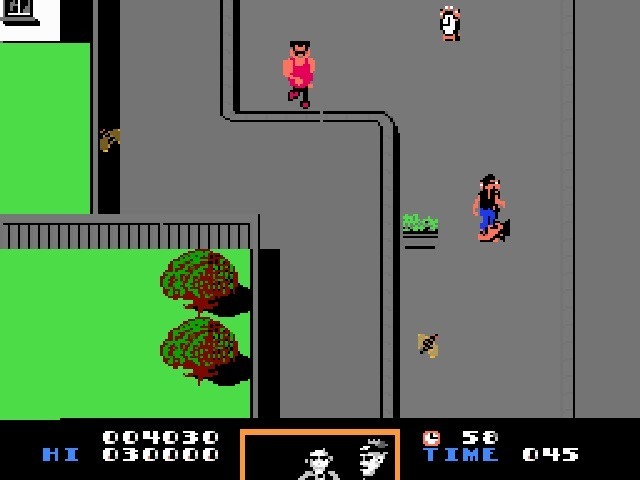 You have a map showing your progress, and you must run at least four sections of streets before you get to each mini-game. These offer a welcome break, but still are extremely poor themselves. 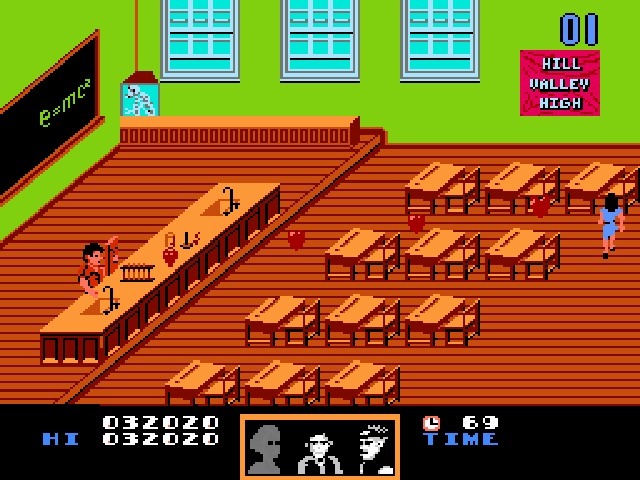 The first game has you behind a cafe counter lobbing milkshakes at approaching bad guys. It’s amusing up to the tenth bad guy. After that you realize that they’re just going to keep coming infinitely until they make it to the counter. Indeed, once you clock your 50th bad guy across the noggin, you’ve beaten this section – however the game never tells you this. The bad guys will just keep coming, and you have to let them get to the bar and throw you out at this point, which up until the pivotal 50 mark meant losing. That’s just bad game making. The second mini-game is the same as the first, except this time you’re behind a desk and blocking your mother’s affection (rapid-fired at you in the form of hearts) with a book. There’s nothing really else to say, if it sounds moronic to you, that’s because yes, it is. Both of these sections suffer from the same control issue. There are only about eight places you can be behind the desk or counter, and the hearts and bad guys will approach you from these eight areas. However there are NO shadows or anything else to show depth; deciding which of the eight “lanes” your foe is coming down is all trial and error. Also the controls are very touchy, so it’s difficult to get to the next position down without skipping it. This makes better sense if you play the game, but please, I beg you, don’t. There are two more games consisting of catching notes on stage (similar to the first three games) and driving your DeLorean to its escape point while dodging lighting bolts (similar to the street sections). However, if you have a shred of sense in you, you will not play the game long enough to get that far. Rest assured, you are missing nothing. Normally I would write a decent description of graphics and sound and such, but this game doesn’t deserve it. The graphics are bland, the control is weak, the sound is horrible. The same tune plays through the whole game, and it’s a poor tune to begin with. This is one of the few games where I honestly can’t give you a single reason why you should play it. Don’t waste your time on this one. This review allowed me to reference Lloyd’s character in Taxi, Run Lola Run, and cooties.